ABSTRACT: The objective of the current study was to develop simple, precise and accurate stability indicating by isocratic RP-HPLC assay method and validated for determination of Phenobarbitone in solid pharmaceutical dosage forms. 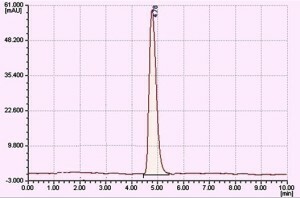 Isocratic RP-HPLC separation was achieved on a analytical C18 R column (250 mm × 4.6 mm i.d., 5 μm particle size) using mobile phase of Acetonitrile: Methanol (65:35, v/v) at a UV detector. The drug was subjected to acid degradation, alkaline degradation, oxidation, photolysis and heat to apply stress condition. The method was validated for specificity, linearity, precision, accuracy, robustness and solution stability. The method was linear in the drug concentration range of 10-60 μg/ml with a correlation coefficient 0.999. The method was also found to be robust as indicated by the % RSD values which are less than 2%. The stress degradation studies showed that Phenobarbitone undergoes degradation in acid, base, oxidation, dry heat (4.80%, 1.52%, 2.16%, and 1.81% respectively). Degradation products produced as a result of stress studies did not interfere with detection Phenobarbitone and the assay can thus be considered stability indicating. INTRODUCTION:Phenobarbital is called a barbiturate that acts by slowing down the activity of brain. Phenobarbital has sedative and hypnotic properties, which will help patients to relax before surgery or help to sleep 1. Phenobarbitone in tablet is assay by using conductimetric titration was done by indirect determination with NaOH 2. The structure of Phenobarbitone was shown in figure 1. MATERIALS AND METHODS 3-8: Phenobarbitone sample was obtained from Abbott Healthcare, Mumbai. Phenobarbitone tablet was purchased from local market. The solvent used Acetonitrile (HPLC grade), Water (HPLC grade), NaOH (AR grade), HCl (AR grade), H2O2 (HPLC grade), OPA (HPLC grade). These chemicals were purchased from Merck Chemicals (Mumbai, India). Selection of mobile phase and chromatographic conditions: Chromatographic separation studies were carried out on a C-18, column on the working standard solution of Phenobarbitone (50μg/ml). Initially, trials were carried out using acetonitrile and methanol in various proportions along with varying pH, to obtain the desired system suitability parameters. After several trials, Acetonitrile: Methanol (pH adjusted to 4.5 with ortho phosphoric acid) (65: 35 v/v), was chosen as the mobile phase, which gave good resolution and acceptable peak parameters. Preparation of Standard stock solution: 10mg of Phenobarbitone reference standard was weighed accurately and transferred in 100ml volumetric flask. Drug was dissolve in Acetonitrile: Methanol (65: 35 v/v) and volume was made up to 100ml with same solvent. So as to get the concentration 100μg/ml. 5ml standard stock solution of Phenobarbitone was then diluted in 10ml Acetonitrile: Methanol (65: 35 v/v) to get working standard solution 50µg/ml. Preparation of mobile phase: Mobile phase was prepared by mixing acetonitrile: methanol (pH adjusted to 4.5 with ortho phosphoric acid) (65: 35 v/v), filtered through 0.45μ membrane filter paper and then sonicated on ultra sonic water bath for 30min. Selection of Detection Wavelength: From the standard stock solution further dilutions were done using Acetonitrile: Methanol (65: 35 v/v) and scanned over the range of 200 - 400nm and the spectra was obtained. It was observed that Phenobarbitone showed considerable absorbance at 237 nm (Figure 2). Chromatogram of Phenobarbitone: The column was saturated with the mobile phase (indicated by constant back pressure at desired flow rate). Standard solution of Phenobarbitone was injected to get the chromatogram. The retention time for Phenobarbitone was found to be 4.78±0.02 min. Chromatogram of Phenobarbitone is shown in (Figure 3). FIGURE 3: REPRESENTATIVE CHROMATOGRAM OF PHENOBARBITONE (50μg/ml, RT = 4.78). Degradation Studies: The International Conformance on Harmonization (ICH) guidelines entitled stability testing of new drug substance and products requires that stress testing be carried out to elucidate the inherent stability characteristics of the active substance. The aim of this work was to perform the stress degradation studies of the Phenobarbitone using the proposed method(8-12). Acidic hydrolysis: 5ml of working standard solution was mixed with 2ml of 2 N HCl and kept for 3 hours. After 3hours solution was neutralized with NaOH then solution was diluted to 10ml with Acetonitrile: Methanol (65:35) and injected in stabilized chromatographic conditions. Under this condition, degradation was observed (Deg-1, RT = 3.24) (Table 1 & Figure 4). Alkaline hydrolysis: 5ml of working standard solution was mixed with 2ml of 1.2N NaOH and kept for 3 hours. After 3 hours solution was neutralized with HCl then solution was diluted to 10ml with acetonitrile: methanol (65:35) and injected & degradation was observed (Deg-2, RT = 3.94) (Table 1 & Figure 5). Oxidation: 5ml of working standard solution was mixed with 3ml 6% solution of H2O2. The solution was diluted to 10ml with Acetonitrile: Methanol (65:35) and refluxed for 3 hours. The solution was injected in stabilized chromatographic conditions. (Deg-3,4,5, RT =2.41,2.50.2.98) (Table 1 & Figure 6). FIG. 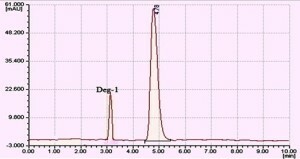 6: CHROMATOGRAM OF PHENOBARBITONE (50μg/ml) AFTER OXIDATIVE DEGRADATION WITH DEGRADATION PRODUCT AT RT 2.41, 2.50, 2.98 RESPECTIVELY. Degradation under Dry Heat: Dry heat studies were performed by keeping drug sample in oven (100ºC) for a period of 48 hours. 10mg of exposed drug was weighed accurately and transferred to a 100ml of volumetric flask and dissolved in Acetonitrile: Methanol (65:35), the volume was made up with Acetonitrile: Methanol (65:35) to get conc. of 100µg/ml. 5ml standard stock solution of Phenobarbitone was then diluted in 10ml Acetonitrile: Methanol (65:35) to get working standard solution 50µg/ml. The solution then injected in stabilized chromatographic conditions (Table 1 & Figure 7). Long UV-Degradation at 366nm: The photochemical stability of the drug was studied by exposing the drug sample to long UV (366nm) light for 48 hour 10mg after exposure, accurately weighed 10mg of drug in 100ml of methanol to get concentration 100µg/ml. 5ml standard stock solution of Phenobarbitone was then diluted in 10 ml Acetonitrile: Methanol (65:35) to get working standard solution 50µg/ml and was then injected in stabilized chromatographic conditions (Table 1 & Figure 8). FIG. 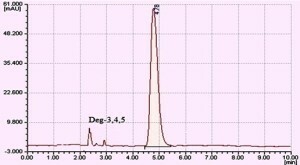 8: CHROMATOGRAM OF PHENOBARBITONE (50μg/ml) AFTER EXPOSURE OF 366 NM, NO DEGRADATION PEAK WAS FOUND. Short UV-Degradation at 256nm: The photochemical stability of the drug was studied by exposing the drug sample to short UV (256nm) light for 48 hour 10mgafter exposure, accurately weighed 10mg of drug in 100ml of methanol to get concentration 100µg/ml. 5ml standard stock solution of Phenobarbitone was then diluted in 10ml methanol to get working standard solution 50µg/ml and was then injected in stabilized chromatographic conditions. No degradation peaks were obtained. Validation of Analytical methods: The validation for HPLC method development was performed using parameters like Linearity, Precision, Accuracy, Limit of detection (LOD), Limit of quantification (LOQ) and Robustness. Linearity: The standard stock solution containing 100μg/ml of Phenobarbitone to prepare range of standard solutions containing six different concentrations of analyte. 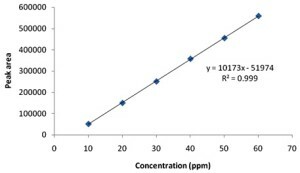 The linearity of the relationship between peak area and concentration was determined by analyzing six standard solutions over the concentration range 10-60μg/ml. The results obtained are shown in table 2 & 7. The peak areas were plotted against the corresponding concentrations to obtain the calibration curve (Figure 9 ). Precision: The precision of the method was demonstrated by intra-day and inter-day variation studies. In the inter day studies, 3 different concentrations 30, 40 and 50μg/ml were injected in stabilized chromatographic conditions and were analyzed in triplicate. The percentage RSD was calculated. The result obtained for intraday variations are shown in table 3 & 7. In the inter day variation studies, 30, 40 and 50μg/ml were injected in stabilized chromatographic conditions and were analyzed. This procedure was repeated once a day for three consecutive days. The percentage RSD was calculated. The result obtained for interday variations are shown in table 4 & 7. Accuracy: To check accuracy of the method, recovery studies were carried out by mixing standard drug solution to pre-analyzed sample solution at three different levels 80, 100 and 120%. Basic concentration of sample chosen was 25μg/ml of Phenobarbitone bulk drug solution to which 20, 25 and 30μg/ml of Phenobarbitone tablet solution was added. These solutions were injected in stabilized chromatographic conditions in triplicate to obtain the chromatograms. The drug concentrations of Phenobarbitone were calculated by using linearity equation. The results obtained are shown in table 5 & 7. Where, σ = standard deviation of response for the lowest conc. in the range; S = slope of the calibration curve. LOQ = Phenobarbitone: 0.1183 µg /ml. Robustness: Robustness was performed by injecting the Phenobarbitone standard solution in to the HPLC by altering the flow rate, changing the pH and changing the composition of the organic solvent from the normal chromatographic conditions. The results are tabulated in table 6 & 7. RESULTS AND DISCUSSION: The developed method was found to be precise as the %RSD values for intraday and inter-day were found to be less than 2%. Good recoveries (98.7% to 100.9%) of the drug were obtained at each added concentration, indicating that the method was accurate. The method was also found to be specific indicated by the % recoveries ranging from 98.7% to 100.9%. The LOD and LOQ were found to be 0.0036µg/ml and 0.11µg/ml indicating the sensitivity of the method. The method was also found to be robust as indicated by the % RSD values which are less than 2%. The summary of validation parameters of proposed spectrophotometric method is shown in Table 7. The stress degradation studies showed that Phenobarbitone undergoes degradation in acid, base, oxidation, dry heat (4.80%, 1.52% , 2.16%, 1.81%respectively). Summary of the results of stress degradation studies of Phenobarbitone are shown in the Table 1. CONCLUSION: All the above factors lead to the conclusion that the proposed method as accurate, precise, simple, sensitive, robust and cost effective and can be applied successfully for the estimation of Phenobarbitone bulk and pharmaceutical formulation and percentage degradation. The proposed method is also useful for determination of Phenobarbitone stability in sample of pharmaceutical dosage forms. Nokhodchi A., Development and chemical stability studies of alcohol-free phenobarbitoal solution for use in pediatrics, American association of pharmaceutical scientist 9, 2008, 939-943. Monzon C., Delfino M., Phenobarbital in pharmaceutical tablets by modified conductimetrical analysis, The journal of the argentine chemical society 96,2008,101-110. 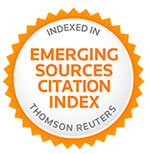 Dunge A, Sharda N, Singh B and Singh S, Establishment of inherent stability of Stavudine and development of a validated stability-indicating HPLC assay method, Journal of Pharmaceutical and Biomedical Analysis 37, 2005, 1115–1119. Kumar R., Rao G. and Naidu P., Stability Indicating RP-LC Method for Determination of Rasagiline Mesylate in Bulk and Pharmaceutical Dosage Forms, International Journal of Applied Biology and Pharmaceutical Technology 2, 2002, 247-259. Dunge A, Sharda N, Singh B, Singh S, Validated specific HPLC method for determination of Zidovudine during stability studies, Journal of Pharmaceutical and Biomedical Analysis 37, 2005, 1109-1114. Trabelsi H, Bouabdallah S, Bouzouita K andSafta F, Determination and degradation study of Haloperidol by high performance liquid chromatography, Journal of Pharmaceutical and Biomedical Analysis, 29, 2002, 649-657. Vignaduzzo S., Castellano P. and Kaufman T., Method development and validation for the simultaneous determination of Meloxicam and Pridinolmesylate using RP-HPLC and its application in drug formulations, Journal of Pharmaceutical Biomedical Analysis., 46, 2008, 219-25. Chopade V., Tembhurkar N., JadhavS. And Chaudhari P., Development And Validation Of A Stability Indicating Assay Method of Mefloquine Hcl By Using Different Stress Degradation Conditions, Journal of Pharmacy Research, 5, 2012, 2631-2635. Mhatre PR, Gatkal SH, Chopade VV and Choudhari PD: Development and Validation of stability indicating HPLC assay method for determination of Phenobarbitone in bulk drug and tablet formulation. 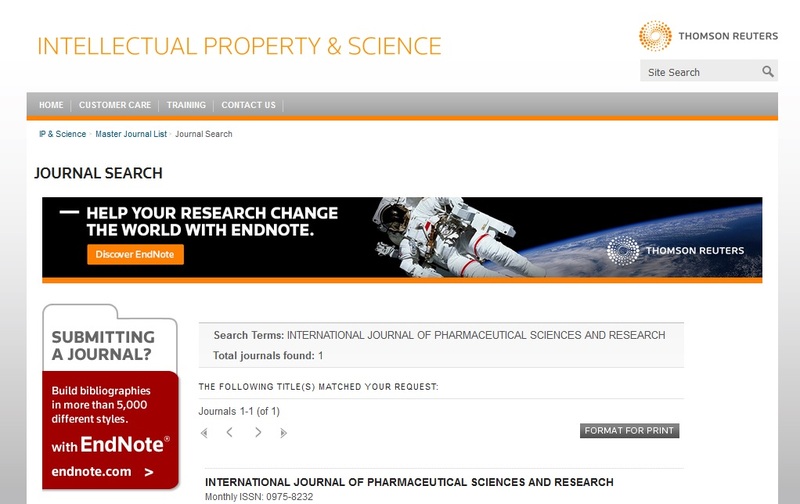 Int J Pharm Sci Res 2013; 4(5); 1820-1826.